Sample application letter for loan by students due to financial problems, father unemployment, loss of family member or any other reason. 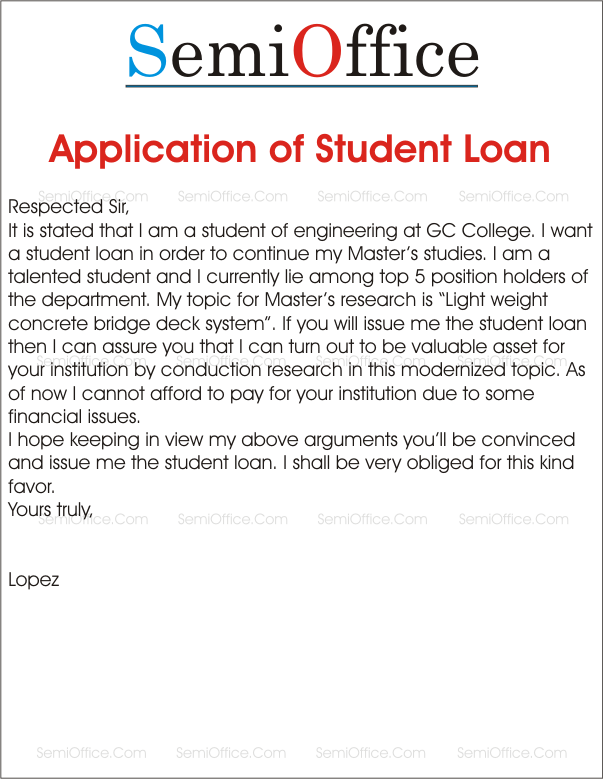 Sample application for educational loan, study loan, student loan from a bank on urgent basis. My name is Charlie and have recently completed my high school education. I was offered scholarships from many institutes but I chose Howard School of Sciences because of its amazing repute, faculty and quality of education but it was due to some other factor that I was not being able to receive a scholarship from the institute and I have to think of some other way. The only way for me to enter in Howard is by financing myself and that is not possible for me to bear that huge burden. I hereby request for financial aid or student loan, so that I will be able to get admission into Howard and pursue my dreams. I have attached my official transcript with this application and also the results of my SAT. I hope that I will be included among those lucky students who have the honor to sit in Howard School. 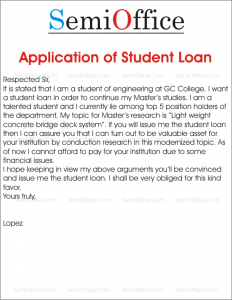 This application is to request a loan to meet my present educational needs. I am a day scholar at National Institute. To pay for my examination and lab fees I need to pay a lump sum amount of 200$ in the next month. To meet my present needs I work part time in a research institute and receive a 10$ a week. So to pay such a huge amount in lump sum is difficult. I request your bank to issue me I student loan of 200$ which I would return your bank within two months. I am ready to deposit any kind of security your bank needs. This would be great if all the procedures are done in a short period of time in order to pay my fees in due time. It is stated that I am a student of engineering at GC College. I want a student loan in order to continue my Master’s studies. I am a talented student and I currently lie among top 5 position holders of the department. My topic for Master’s research is “Light weight concrete bridge deck system”. If you will issue me the student loan then I can assure you that I can turn out to be valuable asset for your institution by conduction research in this modernized topic. As of now I cannot afford to pay for your institution due to some financial issues. I hope keeping in view my above arguments you’ll be convinced and issue me the student loan. I shall be very obliged for this kind favor. I want to say that I have secured my admission at University of British Columbia in Masters of Civil Engineering. I successfully completed my Bachelors in civil engineering with majors in structures. My passing percentage has been 95% in general. However due to some nationality issues I am unable to secure a scholarship for the masters at your university. Dear sir, as you know that the educational as well as living expenses are very huge in amount at this university and also I belong to a third world country due to which I would not be able to bear expenses of this university all by myself. I have been a brilliant student throughout my student career and I am very eager to study at University of British Columbia. Keeping in view my all the problems and hurdles, you are kindly requested to issue me a student loan so that I may continue my journey of knowledge. I have full hope that you will allow finance department to grant me a student loan in order to bear my educational expenses. I shall be thankful to you for this favor. It is stated that I have recently got my name in FAST University. As from my records you can see that I have scored A+ both in my Metric and Intermediate education. And the thing is financial aid was given to me on the basis of my financial condition and educational record. Sir, I have keen interest in studying Computer Science from your university. As FAST University is very expensive so I request you to offer me student loan. It shall be grateful to you for this favor. It will really help me in achieving my ambition. Sir, I am Jayant Sharma and I recently completed my intermediate studies. I applied for higher studies in USA and with the blessings of my family; I got selected at Harvard University. However, the road to success is not paved with flowers. The lack of financial resources is hindering my way to the top. Also, this would become a huge burden on my parents’ shoulders. Therefore, I request you to kindly grant me a loan so that I can pursue my studies at one of the best universities of the World. Thank you for your consideration. I look forward to hearing from you in the near future. My name is Michael and I am a student in the engineering department and I want to bring this to your kind notice that I need a loan to complete my thesis and research on my subjects. Sir my transcript is attached with the application from there you can see that I am a very hardworking and intelligent student. Sir I am nearly to complete with my research and I do not want to back up now just because of the financial problems. That is why sir I am writing this application so as you could give me a loan to complete my studies and research, with interest free loan or with minimum interest rate for loan as possible. It is stated that I have successfully passed Intermediate exam with 75% marks. I am willing to complete my higher education and planning to start CA. Unfortunately, I cannot afford the costly education due to financial barriers. The estimated fee for my education is PKR 6, 00,000. I want you to finance my education and provide a student loan. I shall be very grateful to you. I informed you that I want to study abroad, I applied for admissions in different countries but I can’t take full scholarship for Masters in computer sciences. The scholarship which I was awarded is partial as the government award the tuition fee only. My all other expenses like rent and residence is not included in scholarship and due to this reason I want you to give me loan on the behalf of my mother’s gold. I will return you as soon as possible. I will be very thankful for this favor. I am an account holder in your bank from last five years. I have recently passed Masters in English from Punjab University. Now i am looking for MPhil in same subject and for further studies i need to submit a fee of 2 lacks per year. I request you to issue me a loan according to a special policy of bank for student account holders, so that I could submit my fee and continue my study. This loan could be deducted from my account in every month installment. I shall be highly thankful to you for your kind favor. It is to request you that I have recently done B.com from Government Islamia College and secured good marks. Now I want to take admission in MBA but I am financially weak, I cannot pay my university fee. Please sanction me educational loan so that I can complete my studies. After studies, I will pay off my loan to your bank.